Take the Eat Game Live "Reaper of Recipes" Challenge! Earlier this year, we showcased the delicious Reaper of Soles recipe, a diabolical dinner prepared by the talented gaming gastronome @kierpanda from Eat Game Live. Today, we're teaming up with kierpanda for a special community challenge, one that charges you to create a Diablo-inspired delicacy of your very own! Your mission? Equip your Legendary utensils and reach into the darkest corners of your spice stash to invent a meal fit for any demon-fighting hero. To participate in our "Reaper of Recipes" challenge, simply write down your recipes in English, listing the ingredients and the steps to follow in order to create your Sanctuary-themed dishes, and email them to us at RecipeChallenge@blizzard.com by Sunday, May 11. We'll send the most creative, tasty, and aptly-named recipes to kierpanda herself. She'll then choose her favorite to replicate, photograph, and feature on her blog! 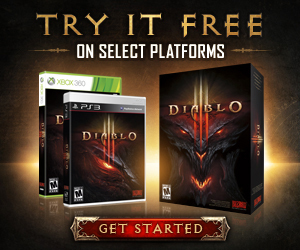 You'll gain culinary fame not only on Eat Game Live, but also right here on the Diablo III community site. The winner of this challenge will also walk away with a nice care package courtesy of kierpanda, including a Diablo III Collector's Edition, Diablo III: Reaper of Souls™ Collector's Edition, and copies of the Book of Cain and Book of Tyrael. So what are you waiting for? Let's get cooking!